Lisa (not real name, M805) is a 35-year-old Indonesian lady. In October 2009 she passed out black stools. She came to Penang for a medical check-up. An upper endoscopy showed acute gastric ulcer but the rapid urease test was negative for H. pylori. Her blood test showed low levels of haemoglobin (8.3), red blood cell (2.9) and high platelet count (431). She was prescribed medication for gastritis and was told to come back for further observation after a month. On 3 December 2009, another endoscopy was performed. It showed an almost completely healed ulcer. A repeat rapid urease test again was negative for H. pylori. A gastric biopsy was also performed and indicated an adenocarcinoma, diffuse type. A CT scan on 11 January 2010 showed a thickening of the gastric antral wall consistent with the clinical finding of carcinoma. The diffuse hypodensity of the liver parenchyma was in keeping with fatty liver change. No mass lesion was seen in the liver. There was no evidence of any focal lung lesion or lymphadenopathy. Lisa underwent an operation to remove her stomach. The histopathology dated 12 January 2010 confirmed a diffuse type adenocarcinoma of stomach, T3N1M1, Stage 4. Lisa was asked to go for chemotherapy. She returned to Jakarta and received one cycle of chemotherapy. The treatment was a disaster. She fainted and had to be admitted to the ICU. She was discharge after four days but could hardly remember many things. She only recovered after a month. Lisa returned to Penang for a follow-up examination with her surgeon. A CT scan on 21 July 2010 showed no evidence of pancreatic, splenic or renal mass lesion. There was no evidence of any lymphadenopathy. There was no obvious recurrence in the surgical bed. Lisa and her husband came to seek our help on 23 July 2010 as she was not prepared to go for any morechemotherapy. She was prescribed Capsule A, Stomach 1 and Stomach 2 teas and C-tea. Mild to moderately dilated intrahepatic ducts. Ill-defined enhancing soft tissue around the pancreas and common bile duct which extends inferiorly along the right retroperitoneum, right paracaval and ilio-psoas down to the right inguinal and upper anterior thigh region. This has infiltrated the right upper ureter. Features are suspicious of tumour/metastatic deposits. Moderate to gross hydronephrosis of the right kidney with diffuse cortical thinning. Lisa and her husband met with the surgeon. The surgeon said it was not possible to undergo further surgery. She was told to go for chemotherapy. That was the only option left. The following is the transcript of our video-taped conversation on 22 February 2012. Husband: January 2011, she had the surgery. Chris: Her stomach was removed. Before the surgery, did you ask the surgeon if the operation could cure her? H: He told us after the removal of her stomach, she would be okay. Then we need to go for chemotherapy. C: Did you explicitly ask if after the surgery, she will be cured? H: He did not answer that question. The surgeon explained that after the surgery, everything would be clean. The cancer would not spread anymore. We believed whatever he said. The reason why we went to him was because we wanted to find a cure. C: Yes, I understand – all patients who come here (from Indonesia) are searching for a cure. So whatever answers you get or what the doctors said, you all would believe them. And also pay whatever it may cost. 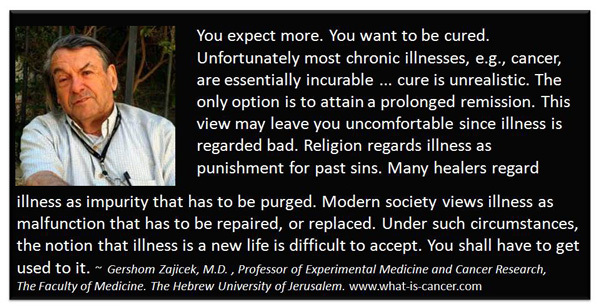 What you all want is a “cure.” I understand that. So, after the operation, how long was she in the hospital? C: How was her health before and after the surgery? H: After the surgery she became weaker – she was worse off. Before the operation, she was okay- okay, normal and there was nothing wrong. C: Why did you go for the surgery then? H: She was okay, she could eat – there not nothing wrong with her. She was told that she had cancer and we were afraid that disease would spread. C (to patient): Can you tell me – before the operation, you were okay? H: Nothing wrong with her except she passed out black stools. Then they did a biopsy after a scan and said it was cancer. H: Nothing – no pain, nothing. If she had pains it would it would have been a different matter. But she was able to eat well. C: And when the doctor asked you to operate, you went ahead with the surgery? And after the surgery, she was not getting better? C: How much did the surgery cost you? C: After the surgery, she had chemo? H: Three months later, she had chemotherapy in Jakarta. There was no problem on the first day after the chemo. The night of the second day, she had a seizure and her hands were shaking vigorously and she fainted. She was admitted into the ICU and was there for four days. C (to patient): Did you remember anything when you were in the ICU? Did you remember going off or flying away somewhere? P: No (shaking her head). H: After coming out of the ICU she could not remember things – memory loss. She could only recognize me. But gradually her memory started to come back. It took about a month for her to become normal again. C: Did the doctor want you to continue with the chemo after this episode? H: At first he said she had to do 3 cycles of chemo, but after seeing what had happened, the doctor did not ask her to continue with her chemo anymore. C (to patient): If you were asked to go for more chemo – do you want to do it again? P: No, I don’t want any more chemo. H: Now, the only solution is chemotherapy. C: You went to talk to the surgeon. He told you she should go for chemotherapy. Did he know what had happened to your wife after the first chemo? H: He knew. But he did not have any more words to say. He told us, there was nothing else he could do except chemotherapy. But how are we to go for chemo after such a bad experience? We are afraid. She is going to lose her hairs and what not. C: You told me earlier that there was another patient in the next bed. She also had chemo when your wife was having hers. H: After the chemo, she became blind. Her eyes could not see anymore. C: What? Before the chemo, were her eyes okay – could she see? H: Yes, her eyes were normal. After two chemos her eyes could not see anymore. She died after the third chemo. C: What? She died after the third chemo? After the second she became blind – why did she continue with the third chemo then? H: Her husband made that decision. Because of what I have seen, I would not want her to do any more chemo. C: Did you really talk to her husband? H: Yes, I talked to him. C: Even after becoming blind, the husband still wanted her to continue with the chemo? H: Yes, he wanted to continue with the treatment. C: Did he tell you why he wanted to do that? H: No and I did not ask. 1. Lisa passed out black stools, otherwise she was okay. What could have happened if she did nothing? Do no surgery or chemo? How bad could she be? 3. Lisa had her first cycle of chemotherapy and she fainted and lost her memory. Her next-bed fellow patient was blind after two chemos and was dead after the third. This clearly shows that chemo is not for everybody. 4. The story of Lisa clearly showed that surgery did not cure her cancer. She expected a cure but she was short-changed. In fact she became weaker and was worse off. 5. 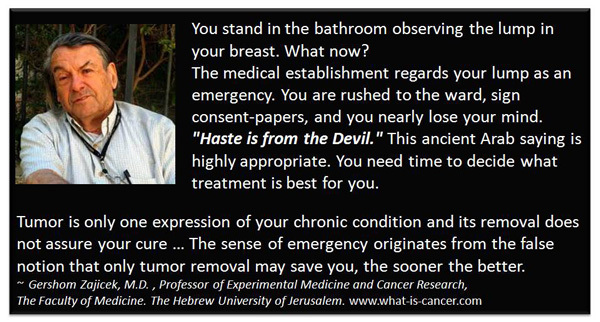 As it is now, after two years, the cancer had metastatised extensively – could her cancer be worse than this if she did nothing? This entry was posted in Failure Story, Medical treatments, Stomach Cancer and tagged chemotherapy, fainted, ICU, recurrence, stomach cancer by CA Care. Bookmark the permalink.